Wondering how many hobie sailers there are in the Sacramento/Folsom Lake area? I know Fleet 17 Commodore Kirk Jeffries R.I.P. obvious isn’t involve but would be interested if it were to start back up. I miss Breakaway Regatta! I'm not in Fleet 17, but after some great help from a friendly Fleet 2 fella named Brett, I'm planning to pony up and join that fleet. I don't know if the drive-to-destination regatta style will fit me, but I think there's one way to find out. I sailed a Spirit 17 in the late 90s and just got back into cats a few years ago when an H18 followed me home. I made it out about every third weekend in the 90's and was out on Folsom almost twice a month last year... culminating in me renting mast-up storage at Brown's Ravine this year and more weeknight sailing than last year. The wind hasn't been hugely favorable yet this year, but I aim to better my average recreation this year... feel free to drop me a line if you'd like to get together on a windy evening or weekend. Thx for the info, I’m on call starting tomorrow through next Thursday so I’ll be stuck at work. Hopefully we’ll get the boat out that following Saturday or Sunday. We’ll be the hobie 18sx. Not too many around. I will be racing my H18 at Woodward May 19th & 20th for Wet-n-Wild http://div3.hobieclass.com/wp-content/u ... R-2018.pdf Hoping to have at least 6 H18 on the line or maybe more? Friday was an amazing wind and wave day... I had a blast! With an average of 16-18mph winds and gusts to 25, it was traveler-to-the-side blasts and mostly mono-rig fun. With wind from the NW, launching from Brown's Ravine meant the waves had the whole width of the lake to build, so we were four-foot slammin'! I've not seen timing more important in whether a tack succeeds or fails -- I got slapped/stopped a few times when I didn't time my carve. My normal and alternate crews got stuck at work, so I recruited a fella who had trailered his Laser to the water but forgot a key piece of equipment. I'm glad I did, the wind was awesome, but the waves were probably such that I should have stayed ashore instead of single-handing. Honestly, once I got away from shore, the wind *was* too much until I poured on the downhaul and outhaul, and could harness forward movement, instead of just dumping wind with the sheet. My crew wasn't really familiar with Hobies -- he committed only to providing ballast, and following specific directions. I was out on the wings except for when I was crossing to tack. More experienced crew would probably have allowed better control and a more balanced set of sails, but Richard was game, and had a blast! I managed to surf a couple of waves while angling back in on a downwind reach, but stopped messing with it after I plowed into a wave. 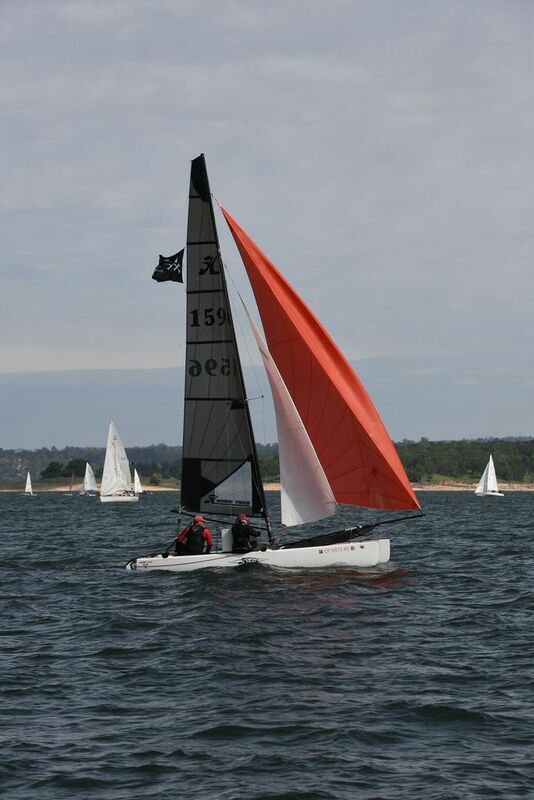 It felt like I'd hit a wall, and I wasn't entirely certain the bows wouldn't just stay dug in while the sail kept driving... gotta love the volume up front in an H18, we would have been swimming for sure on an H16! Folsom Lake doesn't get a lot of wind often, but it sure is fun when it does! Hi I picked up a 16 last week. I’ll keep checking up on this thread to see if anything at Folsom comes up. I’m in the neighborhood. Saw an 18 getting rigged on the beach at Browns Ravine yesterday, Grey Mylar Sails. Anytime be here that was sailing that boat? 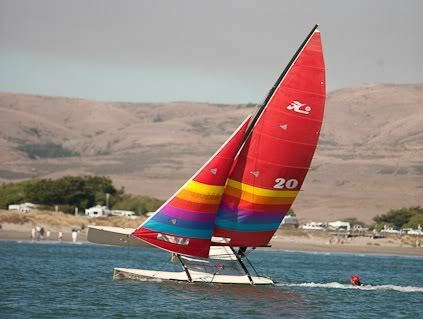 A couple of us will be at Folsom tomorrow Saturday rigging and launching from Hobie Beach. I plan to arrive at about 10am. How was it? Where is Hobie beach? Hobie Beach is also known as Brown's Ravine. Troy and I have each registered, how about you other guys? Last year I did the RV camping at Brown’s Ravine parking lot and it worked out well with parking camp close to the Yacht Club. We were also able to leave our boat on the beach overnight. I plan to do the same again this year arriving Friday afternoon.